This comic is just an extension of thinking about how some universities require faculty to use a certain Learning Management System and how that requirement hems in both the teacher and the learners in many ways. When we talk about open learning systems in space like Connected Courses, this may a roadblock for many faculty. I like how Howard Rheingold responded to my post yesterday, noting that he often pushed and pushed against these institutional restraints and then did covert online learning systems outside of the university purview. Sort of a ‘Don’t Ask Don’t Tell’ approach to open learning. I don’t know if many faculty, with lesser name recognition and clout, are willing to take those chances, particularly if they are not tenured and need to be sure to follow rules, stay in line, keep the upper folks happy (or at least, not get them angry). We need more pirate instructors. Arrr. And that may mean using the university system (Blackboard, Moodle, whatever) but thinking through the many ways to “hack the system” to make it work for you and your learners, even as you still technically fall within the sphere of your educational institution. 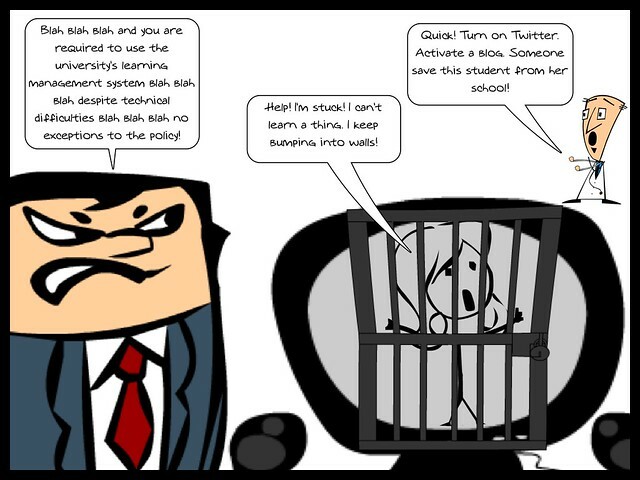 This entry was posted in CCourses, comics. Bookmark the permalink. I am not required to use Bb in my F2F classes, but I do use it in my online classes. The reason I do is because students expect it. They have learned to expect it. I don’t think that I am required to use it. In fact I have looked at alternatives and I think some are better than others, but most just don’t work much better because they are all just mighty hubs that funnel all the work into the great mixmaster in the middle. That is the genius of ds106. It does more than that. It moves away from the hub and spoke model and more toward the old DARPA inspired distributed node model. And they have figured out that play may be at the center of the work of the class, but that it is not the hub. It can’t be. The very structure of the Uni makes it very hard not to become a subversive if you have connected learning values. And it is a mixed bag. For example, I have a G+ community with every Bb community now. I am pretty hands off ish with them. I try to throw in projects and Ds106-style challenges on a regular basis, but strategic students don’t like to play. Play is anathema to getting me that A, Mr. Elliott. Anathema. Why? The structure of the system (University, credentialling, Bb) all mitigate against play and its freedoms and connections. For me it nothing short of pitched battle to keep pushing for play, but I know from our #clmooc experience that play is the ultimate connector. Jeez, I am sorry to go on, but this is where I live. If ever I go too far in these comments and don’t address what post calls for, don’t hesitate to tell me to “step off”. I’d give you my whole blog just to let you go, Terry, so I will never tell you to step off. Step on in .. is more like it. Thanks for sharing your perspectives.